I never really liked it when they put a lot of ice in the beerlao. Couldn't they just put the bottles in the fridge or something. Water'd down beer doesn't taste too good and it kind of hurts my stomache, but I'm not much of a drinker anyways. I was forced to drink from the same cup they pass around, man that was nasty but fun at the same time. I think the ice was not purified so it gave me a stomache ache. The business would need to buy a lot of fridges if they were to use them to store all their beers. As you know, Lao people drink a lot. Drinking from the same cup and sharing soup from the same bowl is part of Lao culture. For me, it's nasty too, and there's no way that I would share anything even if they are family members. I guess they never heard of a keg. They could even put them bottles into a barrel of cold water. Chill the beer before serving, oh well, it's only beer. You never had to drink from the cup that gets passed around? You aren't lao unless you've done that. I try to find a spot on the glass that looks the least dirty and then I don't even put my lips on the glass, just suckk up the beer without touching the glass or let it just pour into my mouth, haha. The worst is when they don't even pour out the leftover from the previous drink and just pour you one straight after. Hope everyone brushed their teeth that morning or didn't eat some larp dip just before, haha. Now if everyone around the table were hot chicks like in those pics, I'll drink it all down with a smile. I hate sluts, they turn me on, haha. Next time I go to Laos I'll have some adventures to tell for sure. They make more profit by keeping their beers warm, because by doing this the customer also needs to buy ice. Ice in Laos is not for free. I have never drank from a cup that has been passed around, even at weddings. The bride and groom are not offended because they know that I don't drink alcohol. Come with pics, thousand words are less than one pic. Thanks! ha ha ha ! If ice is money, then, hot beer is only choice. I dont like put ice into beer or beer into ice. Beer is beer, ice is ice. I love Beerlao, but, a little expensive. If ice is money, then, hot beer is only choice.Â I dont like put ice into beer or beer into ice. 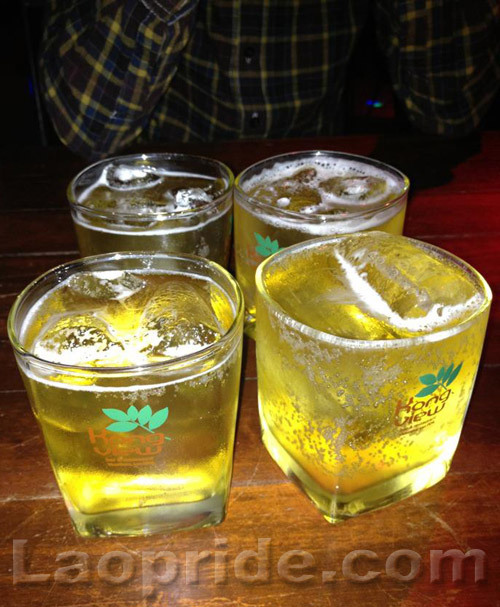 Beer is beer, ice is ice.Â I love Beerlao, but, a little expensive. People in Laos don't seem to have any issues with ice in their beer, they actually like it. I guess they are used to it. A large bottle of Beerlao only cost a dollar, I don't think you can buy any beer in your country at that price. I think the beer was cheaper than bottled water in Laos, haha. The bottled water tasted nasty anyways and I could never find a trash can to throw it away after. There was some elephant water and tiger brand also. I actually prefferred to drink pepsi while I was there, it helped the food go down and killed my stomache ache. I didn't really notice that the ice cost money, someone always brought it and filled my glass with it, guess it was the good service by them beer chicks. I had to drink some heineken so that the girl would pour my glass since she was wearing a heineken dress. This was at this restaurant where they served "dat seen", it's been there for so long now, everytime I go to Laos I visit that place, it's like a ritual now. I think that there is a new hang out place in Vientiane my friend took me, it's where people go to meet up and eat and drink, lots of tables, lots of youngens and lots of beerlao. 1 $ can buy any large bottle of beer any brand. But, 1 $ is about 10 cent short to buy a small bottle of Beer Lao here. Where you from peterpan, don't tell me never never land, haha. Don't you know the old saying, no money, no honey, just funny. You are driking beer lao or watching beer girls? Here, a larg bottle of beer here is half of 1 $. 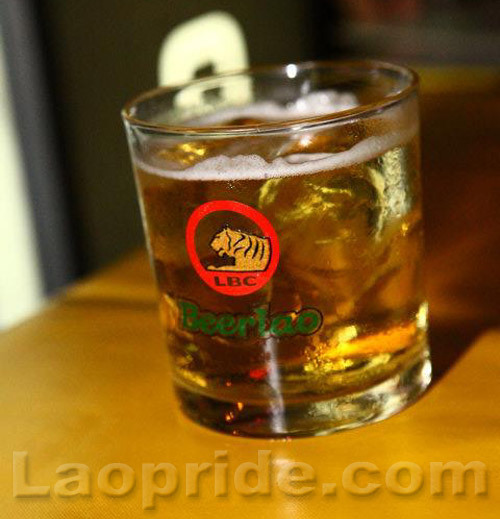 I love beer lao because it is strong. I love that.